The Softball Chenille Pin is the perfect addition to your lettermen jacket when looking to show off your favorite school sports. This pin supports excellent team spirit and pride! Great a gift for your coach or to hand out to your teammate. 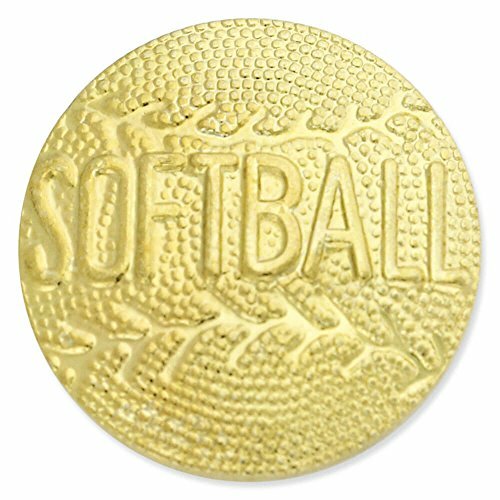 Our Softball Pin is chenille gold plated and includes an extra-long 10mm post with a clutch back. GO TEAM GO!! Available as a single item or bulk packed. Select your quantity above. Order more, Save more! The Softball Chenille Pin is the perfect addition to your lettermen jacket when looking to show off your favorite school sports. This pin supports excellent team spirit and pride! Great a gift for your coach or to hand out to your teammate. Each piece includes a clutch back and is individually poly bagged. If you have any questions about this product by JDS Industries, contact us by completing and submitting the form below. If you are looking for a specif part number, please include it with your message.